My sister Laura is hosting her first-ever Thanksgiving dinner today, in her awesome new house, and we discussed what all we were to bring, I reminded her of the two most essential pieces of a Cudmore Family Thanksgiving: Brown & Serve rolls, and canned cranberry sauce. My understanding and celebration of the Thanksgiving dinner is based entirely on how my grandmother, Cora Cudmore, made it for my sisters, my dad and I. My parents were divorced, so we had an early dinner with my grandma and then went for a second, later dinner at my grandmother Rivkah’s house. I was usually still full, so I just had dessert. But oh, the classic American spread Grandma put forth! It was like something out of a vintage Good Housekeeping. We started with Chicken in Biskit crackers on a fancy silver tray, with port wine cheese spread and olives, which I never ate because olives are gross. She pulled out her good dishes for the holidays, a brown and tan set that she got every piece of — including the gravy boat and pitcher — with grocery store stamps. As a kid, I thought those dishes were ugly, but now I would give away every beautiful pot and pan and gadget in my kitchen to see them on the table again. 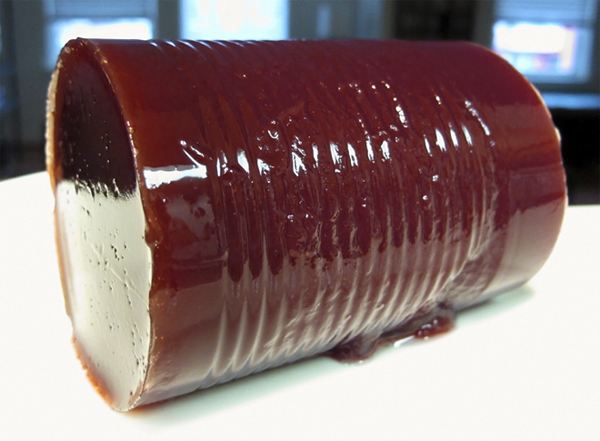 The cranberry sauce was sliced along the can rings. The brown-and-serve rolls were in a basket with a tea towel and a warming stone. And there was turkey and mashed potatoes and gravy in the matching gravy boat, of course, and a little salad each. It wasn’t super-fancy, but it had that certain post-war Americana feel to it that has always been a sort of siren song to me. She grew up poor, she left a no-good husband and raised my amazing and wonderful dad by herself. Entertaining was important to her, to show that she had manners and class. Even though we were just in her eat-in kitchen, she dressed up and expected the same of us. It was a party, after all. Happy Thanksgiving everyone. Enjoy this time with your friends and family, whatever type of cranberry sauce you decide to serve. In fact, I’ve only just found a home made cranberry sauce I can stand (the traditional Donohue family cranberry sauce, you see, involves cranberries and an orange and either a meat grinder or blender. Not texturally appealing to me, regardless of taste). I somehow FORGOT to buy the canned for yesterday, so I ended up making this other, which tastes almost the same (it would if the sugar got ramped up!) but still leaves the cranberries discernible at the end.